If you're in search of a casual yet totally chic outfit, try teaming a grey crew-neck sweater with a black mini skirt. Both items are totally comfy and will look fabulous paired together. Up the cool of your outfit by finishing off with pink leather pumps. If you're searching for a casual yet totally stylish getup, wear a Calvin Klein round neck jumper and a grey leather mini skirt. Both garments are totally comfy and will look fabulous together. Bump up the cool of your getup by completing it with grey suede over the knee boots. 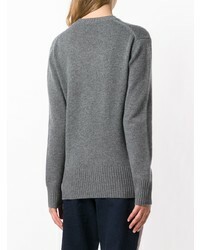 If you're hunting for a casual yet stylish getup, dress in a Calvin Klein round neck jumper from farfetch.com and black jeans. Both pieces are totally comfy and will look fabulous together. Kick up the cool of your getup by completing it with beige leather loafers. 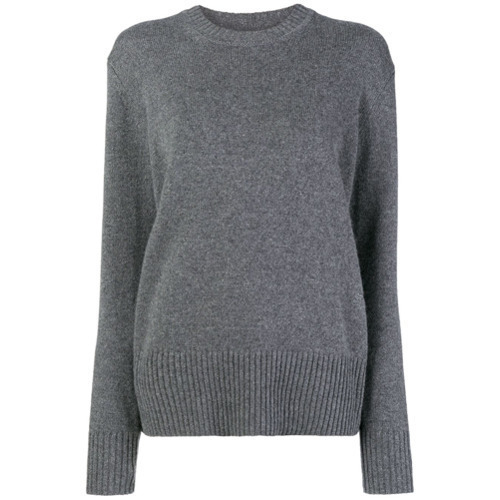 If you're hunting for a casual yet totally stylish look, rock a Calvin Klein round neck jumper with a grey mini skirt. Both garments are totally comfy and will look fabulous paired together. Black leather over the knee boots will instantly smarten up even the laziest of looks. If you're scouting for a casual yet totally stylish ensemble, reach for a grey crew-neck sweater and a black leather mini skirt. Both garments are totally comfy and will look fabulous together. Add black heeled sandals to your look for an instant style upgrade. 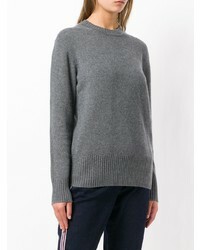 If you're on the hunt for a casual yet chic ensemble, dress in a Calvin Klein round neck jumper and beige skinny pants. Both garments are totally comfy and will look fabulous paired together. Let's make a bit more effort now and throw in a pair of beige leather platform loafers. We're all seeking comfort when it comes to dressing up, and this combination of a Calvin Klein round neck jumper and a pink skater skirt is a great example of that. Bring a touch of sophistication to your look with beige leather pumps. We're all seeking comfort when it comes to dressing up, and this combination of a Calvin Klein round neck jumper and black leggings is a perfect example of that. A pair of grey athletic shoes will be a welcome addition to your ensemble. If you're all about relaxed dressing when it comes to fashion, you'll love this chic pairing of a Calvin Klein round neck jumper and black ripped skinny jeans. Complete your look with tobacco suede lace-up flat boots.